Artfully combining style and function, this spiral-shaped halogen fixture comes from the Pro Track lighting collection. It features 5 halogen bullet lights that can be aimed and positioned as needed. A great look for kitchens or offices.- 15 3/4" wide at widest point from bullet to bullet. Extends 8" from the ceiling. Canopy is 5" wide x 1" high. Weighs 4.3 lbs.- Includes five 50 watt GU-10 halogen bulbs.- Adjustable five-light spiral ceiling light by Pro Track®.- Brushed nickel finish adjustable lights, spiral arm, and canopy.- Easy to install: installs in a ceiling junction box just like a regular ceiling fixture. Mounting hardware included.- Includes 7" black, white and ground cord. 120V. UL listed.- Swivel rod measures 12"wide. This dimmable S-wave track fixture is a convenient, stylish way to light a room. The included halogen bulbs can be directed to highlight features of a room or provide additional light for tasks. The curved arms and white glass shades can be adjusted if necessary.- 38" wide x 19 3/4" deep maximum when lights are fully adjusted. Lights are 7 1/2" long. Canopy is 7 1/2" wide x 3/4" high.- Includes six dimmable 35 watt GU10 halogen bulbs.- S-wave track fixture from Pro Track.- Six adjustable halogen lights with white glass. Brushed steel finish bar and canopy; metal construction.- Installs in a ceiling junction box like a regular ceiling fixture. This track-style ceiling light will add bright and flexible lighting to your home with its stylish bullet lights. The fixture features six frosted glass bullets and a Pewter finish. Fully adjustable stems add to the appeal. Perfect for kitchens, great rooms, hallways and more.- 50" wide bar x 9" high. Canopy is 5" wide x 1 1/2" high. Weighs 17 lbs.- Includes six 50 watt GU10 base halogen bulbs. Maximum 50 watt bulbs. 120V. UL listed.- Adjustable contemporary track-style six-light ceiling light fixture by Pro Track®.- Pewter finish. Metal construction. White frosted glass on each light.- Installs into a ceiling junction box like any other ceiling fixture; no track or transformers to worry about. Mounting hardware included. Great lighting for almost any room in your home or office! This low voltage complete track kit installs quickly and easily. Kit includes a 4-foot length of track, 3 adjustable bullet lights, and a floating canopy. Takes three 50 watt MR16 bulbs (not included). Place the track lights anywhere on the track to illuminate kitchen areas and more. Cord and plug adapter with in-line on/off switch sold separately.- Track kit includes: 4-feet of track, three 7" high track light heads, and a floating canopy that is direct/hardwired. 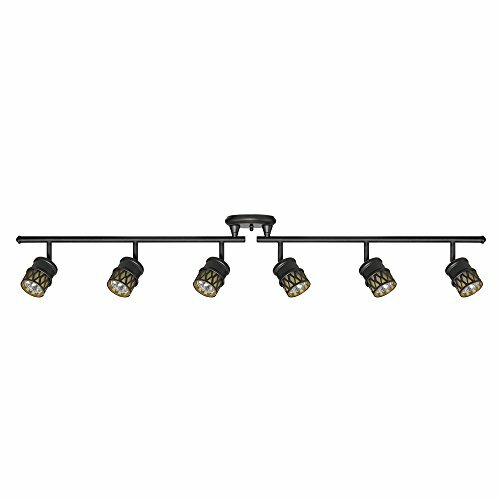 Weighs 3.90 lbs.- Uses three maximum 50 watt G5.3 MR16 base bulbs (not included).- Black finish track and swivel head adjustable lights from the Pro Track brand.- Can connect up to two tracks together maximum.- Optional cord and plug adapter sold separately. Mounting hardware not included.- 12V - low voltage. 120V AC. UL listed. 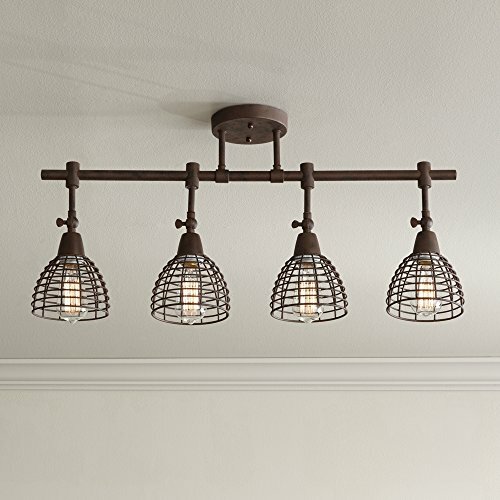 This metal grid track fixture makes a handsome accent above a seating or entertaining area. The bronze finish design is ideal in urban and industrial inspired decor settings. Pictured with old-fashioned Edison bulb that gives it an authentic retro touch.- 30" wide x 16" high. Shades are 5 1/2" high x 4 1/2" wide. Canopy is 5" wide x 1" high.- Takes four maximum 100 watt Edison style bulbs (not included).- Industrial-inspired four-light track fixture by Pro Track®.- Bronze finish. Cage lights pivot-tilt adjust.- A hassle-free way to get the look and functionality of track lighting.- Track lighting style fixture – easily installs in a junction box like any ceiling light. Clean, cool and contemporary, this eye-catching track light kit provides instant glamour and visual appeal. The horizontal wave design adds a dynamic, curved look. A great look for kitchen lighting. It comes in a crisp satin nickel finish and features six lights, each of which is fully adjustable.- 70 1/2" wide x 12" high. Weighs 5.60 lbs.- Each light head is 4 1/4" high x 2 1/2" wide. Canopy is 6 1/2" wide x 1" high. 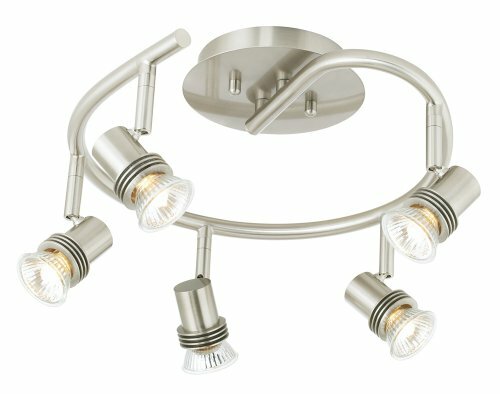 - Includes six 50 watt GU10 halogen bulbs.- Contemporary adjustable six-light wave bar track fixture by Pro Track®.- Satin nickel finish.- Extends 12 1/2" from the ceiling when bulbs are turned sideways.- Bar to canopy height is 6" high.- Extends 13" from the ceiling when bulbs are turned downward.- CUL listed.- Mounting hardware. 120V AC.- Heads swivel adjust, but are fixed on the pole.- Hassle-free installation - installs in a ceiling junction box. Mounting hardware included. A 6-light LED track fixture from Pro Track® in a brushed nickel finish. Constructed in steel with six adjustable light heads that can rotate 180 degrees in either direction. A beautiful addition for your decor.- 59" wide x 10 3/4" high. Canopy is 6" wide x 1 1/2" high. Weighs 5.07 lbs.- Six built-in dimmable 5 watt LEDs. Comparable to a 150 watt incandescent. 2350 lumens. 3000K. 80 CRI.- Track lighting style fixture from the Pro Track® brand. Easily installs in a junction box like any ceiling light. 120 volts.- Six adjustable light heads rotate 180 degrees either direction.- Brushed nickel finish frame and canopy. Steel construction.- LEDs have an average 25,000 hour service life when used 3 hours per day. Clean, cool, and contemporary, this eye-catching, "s" shaped bar track light kit provides instant glamour and visual appeal. It comes in a crisp brushed steel finish and features six lights, each of which is fully adjustable. You can also change the hang height by adjusting the dual downrods. The line voltage track-style fixture is easy to install; just install in a ceiling junction box like a regular ceiling fixture.- 54" long x 21 1/2" wide. Extends 6 1/2" to 14" from the ceiling. Canopy is 6 1/2" wide x 1" high. Weighs 5.31lbs.- Includes six 50 watt GU10 halogen bulbs. 120 volts. UL listed. Includes 7" black, white and ground cord.- S-shaped track kit fixture with swivel arm and six fully adjustable lights from the Salazar collection by Pro Track®.- Brushed nickel finish track and bullet lamp heads. Metal construction.- Installs in a ceiling junction box just like a regular ceiling fixture. Mounting hardware included. From Pro Track® comes an innovative track fixture with six adjustable lights. The satin nickel finish offers a sense of contemporary allure to any space, while a pair of swing arms allows you to position the bulbs at a variety of angles to customize your illumination. Perfect for living rooms or entertaining areas.- 70" wide x 8" high. Each swing arm is 23 1/2" wide. Canopy is 4 3/4" wide.- Includes six non-dimmable 5 watt GU10 base LED bulbs: 2280 lumen light output, comparable to a 150 watt incandescent. 3000K. 80 CRI.- Maximum acceptable wattage for each socket is 50 watts.- Innovative swing-arm track-style design by Pro Track®.- Satin nickel finish over metal construction.- The easy way to get track lighting; installs in a junction box like any ceiling fixture.- Mounting hardware included.- LED averages 20,000 hours at 3 hours per day.- Line voltage - 120 volts. Compare prices on Pro Track Lighting at ShoppinGent.com – use promo codes and coupons for best offers and deals. Start smart buying with ShoppinGent.com right now and choose your golden price on every purchase.